The gift certificate for Vintage Fitness from my daughter got me started on a wonderful journey that I wasn't expecting or asked for! I was hesitant at first but I can't believe the wonderful changes that have occurred. Working with Erin has given me the confidence to work at getting healthier through exercise, good diet and determination. I have lost weight, my blood pressure has dropped, I feel more energetic and best of all I am motivated to keep it up! 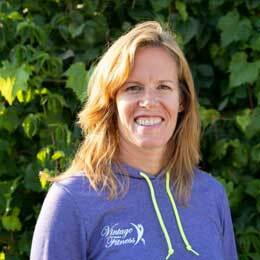 I highly recommend Vintage Fitness and value Erin's expertise in knowing what is best for my body, updating my program and keeping me on track.. I've been working with Erin, and then Leigh, for almost two years and it's been great. They both have a warm, empathetic approach and have developed very effective cardio and strength-training programs for me. I enjoy the sessions and am definitely much stronger since I started with them. I highly recommend Vintage Fitness for a personalized, effective approach to fitness! Erin started Vintage Fitness in 2005. Her vision was to create a team of professionals that understand how to motivate and train people over 50 in a way that is challenging, effective and safe. She has two Biology degrees from the University of Guelph and an MBA from McMaster. She has been training older adults for 11 years and teaching group exercise classes for 18. She plays hockey, runs, does yoga and strength trains.